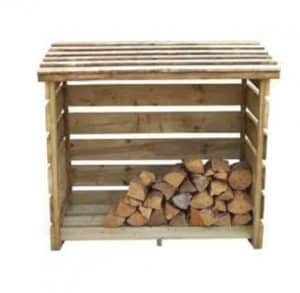 The Hartwood FSC Small Woodstore is a great looking way to keep all the wood you need for your log fire or even as a place for you DIY enthusiasts to keep a whole load of wood for various projects. 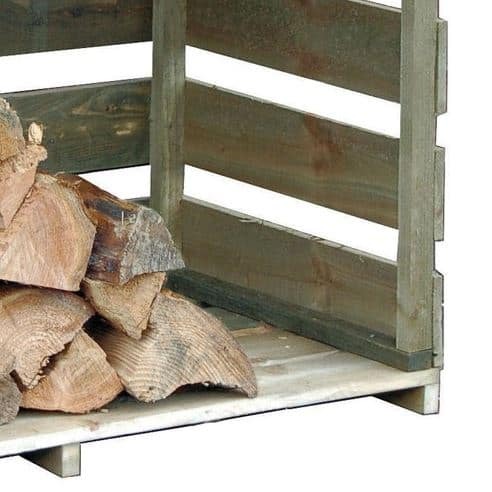 This is something that is very easy on the eye, but as well as being something that has an attractive look, this woodstore is also very practical and is going to be something you get a whole lot of use out of. Its compact size makes it ideal for gardens of all sizes, even gardens which do not have a whole lot of space will be able to find a place for this. 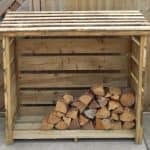 This is one very cleverly designed woodstore which has been made so that it can store a very decent amount of wood and also allow the wood to get a good amount of air, keeping the wood as dry as possible so when you do want to sit in front of the fire, you always have some dry wood at the ready. 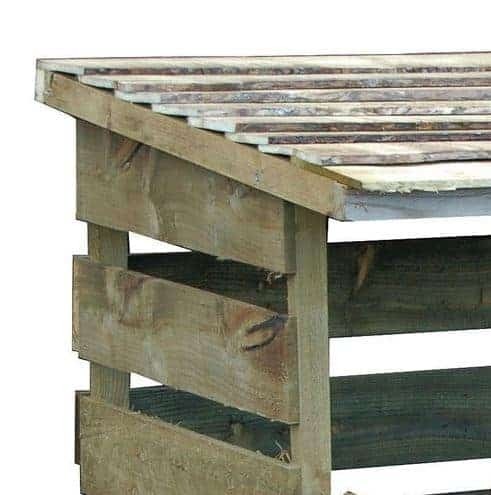 Made with impressively thick wood and kept together with a solid frame, you will find this to be a far more sturdy and solid structure than you would think. Do to the impressive way this has been made this is something which you are going to easily get 20 or more years out of which considering the very low price makes this one fantastic deal. Having a roaring log fire in your home is one of the best things you can have. There is nothing better than putting your feet up after a long hard day, with a cup of hot chocolate while you are sitting in front of a log fire. 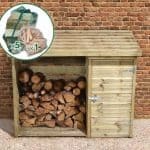 The Hartwood FSC Small Woodstore is the most convenient and low cost way to keep your wood organised, safe, in an easy to reach place and also it has a very nice look to it as well. 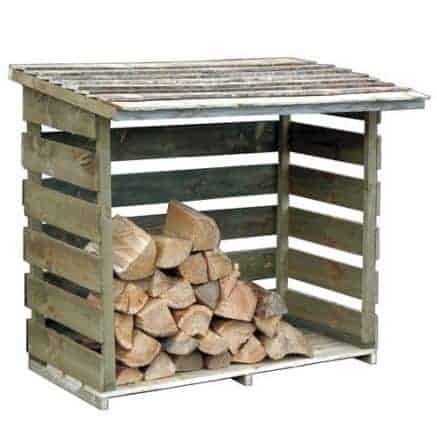 This woodstore can actually hold quite a lot of wood and even though it is rather small in its size. The width is 4 feet, and the depth 2 feet 8 inches, so as you can see this is not going to take up a whole lot of space in your garden. Its small size means that it would fit very well just outside a backdoor so that your wood is always in easy reach. 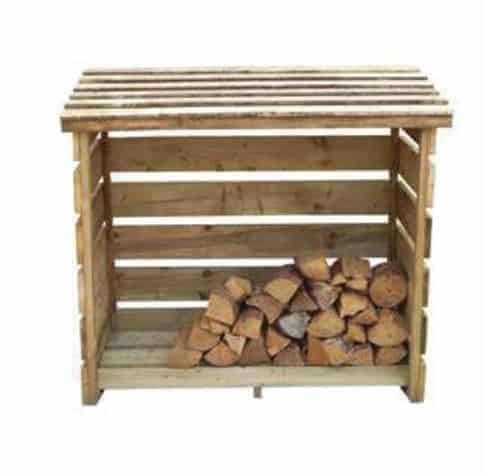 The woodstore stands at 3 feet 7 inches high so even its height is a good compact size that will allow it to fit in pretty much anywhere. The roof of the log store is something that really, Harwood could have just slapped a flat piece of solid sheet boarding on and called it a day. But they have gone the extra mile by making sure the roof has a very attractive look to it. There is a solid sheet boarding pent style roof here, but rather than just leave it at that, they have covered the boarding with this very nice overlap wooden design which we really like. The sides and the back of the woodstore have a very interesting look to them in that they have used spaced out wooden planks rather than some kind of cladding or solid wood. 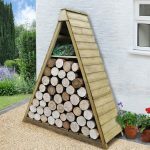 This is actually a very clever design choice as it allows fresh air to get into your logs so that they will get aired out and dry a little bit after they have taken a beating from the rain. All of the wood used in the construction has been pressure treated so this really has been made with taking a bit of abuse from the weather in mind. This is one very well made and robust woodstore and that is because of the very impressive frame that they have used. To be honest with you at this price point we did kind of expect them to just nail this whole thing together at the boards and not bother with a frame so we were very impressed and happy to see that there is a solid 46 mm x 28 mm frame holding this together. So that your wood is not sitting on the floor, Harwood have made used some thick boards that sit on top of high quality floor joists. We really like the way they have designed the floor as it can take the weight of a lot of wood, offers protection from the cold wet ground and it also helps them be able to sell this at a very affordable price. All of the wood has been pressure treated which at this price really is quite incredible. But we would still highly recommend that you give this a coating of wood treatment to make sure that there is no chance of rot. A fresh coating of treatment should be applied once a year which we know may sound like a lot of work, but due to the small stature of the woodstore it will take you no time at all. The Hartwood FSC Small Woodstore comes with a 15 year anti rot guarantee, but this is only valid if you treat the woodstore properly. As you can see from the pictures this woodstore is able to hold a considerable amount of wood. This makes this a woodstore that is ideal for those of you who love to sit next to a roaring fire, but do not want to give up a lot of space in their garden to something like this. 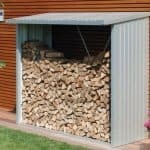 In general we feel that the storage area of this is ideal and will see you being able to stockpile a decent amount of wood. The last thing you want is to wake up, go outside and see your woodstore laying in the middle of the garden because it has blown over in the wind. We are very pleased with the overall stability and strength of this woodstore and even without being filled up with wood, we are sure this is one structure that is going to stay where it is supposed to be and not get blown around in the wind. While we are sure many people will just give this a coating of basic wood treatment and leave it the way it is. You could always jazz this up a little bit by painting it a colour which goes with the rest of the furniture in your garden. 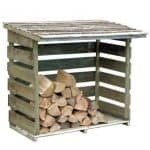 Harwood are not trying to pry any more money out of you with this woodstore with a whole bunch of unnecessary extras, which is always something we like to see you just buy it and that is all there is to it. We are very impressed with the overall robustness of this woodstore and the quality all through it is actually very high. 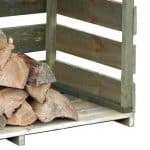 With the wood being pressure treated and the overall design being so amazing, you are going to get easily 20 years or more out of this woodstore. To keep the wood free from rot, you must give it a coating of wood treatment, but due to the size this is not going to take you too long. This is a rather compact woodstore, but you will find that you can fit a whole load of wood inside of here, but it is still one of the smaller woodstores that we have seen so if you have a particularly large fire then you may find you have to keep topping this up more often than you would like. This is a very simple installation service that can be done by just one person. It should not take you too long and in all honesty we have seen children’s toys that are harder to put together than this. In general we are very happy with this and feel that the asking price is very fair, especially considering how well made it is. 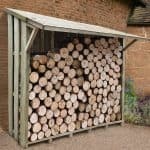 Final Thoughts: If you are sick of having a pile of wood standing up against the house or the kids throwing it around the garden like they are in some kind of mini Highland games, then the Hartwood FSC Small Woodstore offers you a low cost and very practical way to store your wood. This means that some well aired out wood will always be close by in those winter months when all you want to do is sit and relax in front of the fire. One of the most impressive aspects of this woodstore is how it is so well made, despite the very low cost. In all this is something that is very easy to recommend and if you do have a log fire in your house then you will just love this.